Asus will be starting with a mid-range smartphone to compete in the crowded segment with giants like Redmi series and Motorola's G series. Flipkart and Asus turned official partners last week. Now, the company is launching the first smartphone of this series. Asus will be starting with a mid-range smartphone to compete in the crowded segment with giants from the Redmi series and Motorola's G series. Under this new partnership with Flipkart, Asus will bring its latest and greatest smartphones here in India. However, the company won't be launching the much anticipated Zenfone 5 series today. Instead, we will be getting a mid-ranger with mammoth battery. Asus is will be launching the Zenfone Max Pro M1 at an event in New Delhi. The event can be streamed live on Asus' YouTube channel or their official Facebook page at 12:30 pm. Earlier, we reported a leak of what looks like the phone that will be launched today. Popular tipster, Evan Blass revealed press renders and even specification of the Zenfone device that is likely to launch at the event in Delhi. If the report is to be believed, the phone will come with an 18:9 display with a dual camera setup. The images show an display with slim bezels and rounded edges. Looking at the leaked image, it is clear that there is no notch on top of the 6-inch screen. However, one can find quite a bit of chin on the top and bottom at the front of the device. The back of the Zenfone Max Pro M1 houses a dual camera setup at the top left corner and the fingerprint scanner. The Zenfore Max Pro will be powered by the new Qualcomm Snapdragon 636 SoC, as Asus had revealed earlier. The same processor can be found on Xiaomi Redmi Note 5 Pro and Asus Zenfone 5. The leak suggests that the processor will be coupled with 4GB of RAM. The smartphone will have microSD dedicated support along with dual SIM cards. Blass tweets show two colour options - blue and silver. 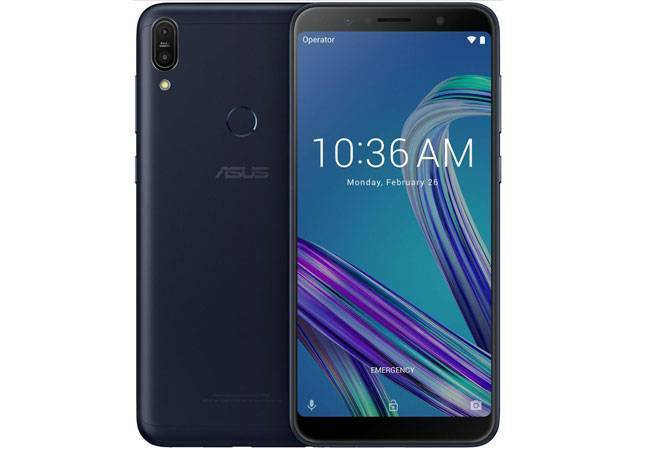 Earlier leaks have indicated that the Zenfone Max Pro M1 will have stock Android out of the box, instead of the Zen UI that is usually found on all Asus devices. The biggest USP of the device will be a massive 5,000mAh battery. There is no word on the pricing yet, but going by what Asus announced last week, we can expect the device to be priced in the mid-range price segment. A new value-added service will also be revealed at the event.